It&apos;s clear that we also need a Person table as we&apos;ll keep actors/actresses by their ID. It&apos;s better to call it Person as actors/actresses might become directors, scenario writers and such later. For consistency, change type of Gender property in PersonForm.cs and PersonColumns.cs from Int32 to Gender. On the title of edit dialog, first name of the person is shown (Carrie-Anne). It would be nice to show full name. And also search with full name in grid. We specified SQL expression Expression("(t0.Firstname + &apos; &apos; + t0.Lastname)") on top of Fullname property. Thus, it is a server side calculated field. By adding QuickSearch attribute to FullName, instead of Firstname, grid will now search by default on Fullname field. But dialog will still show Firstname. We need to build and transform templates to make it show Fullname. Why Had to Transform Templates? Here we see that getNameProperty() method returns PersonRow.nameProperty. 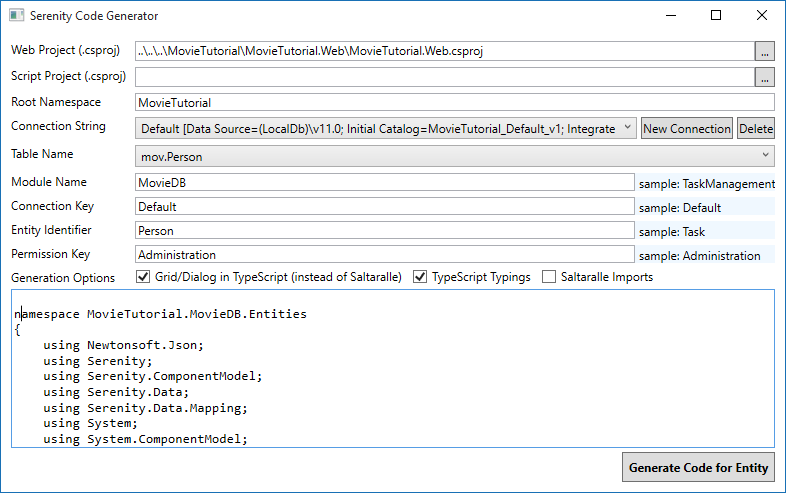 PersonRow typing in TypeScript is in a file (MovieDB.PersonRow.ts) generated by our T4 templates. This metadata (name property of PersonRow) is transferred to TypeScript with a code file (MovieDB.PersonRow.ts) that is generated by ServerTypings.tt file. Similarly, idProperty, localTextPrefix, Enum Types etc. are also generated under ServerTypings.tt. Thus, when you make a change that affects a metadata in these generated files, you should transform T4 templates to transfer that information to TypeScript. 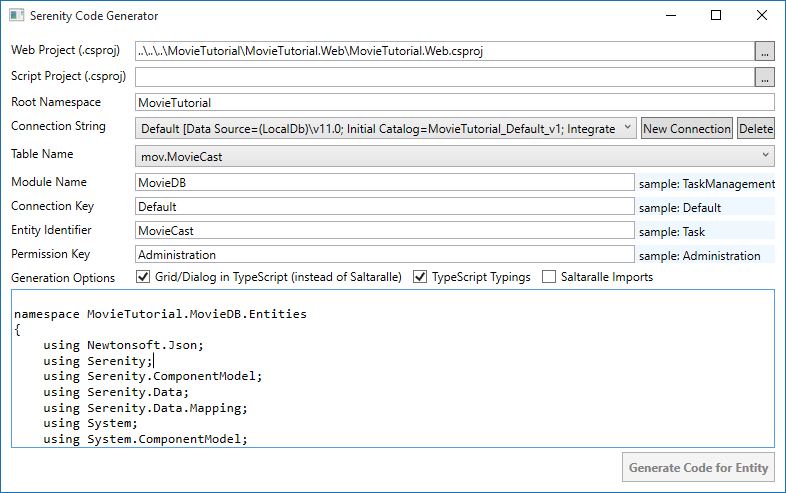 You should always build before transforming, as T4 files uses output DLL of MovieTutorial.Web project. Otherwise you&apos;ll be generating code for an older version of your Web project. We&apos;ll use it for editing Movie cast later. Again, build and transform templates. Up until now, we created a page for each table, and list and edit its records in that page. This time we are going to use a different strategy. 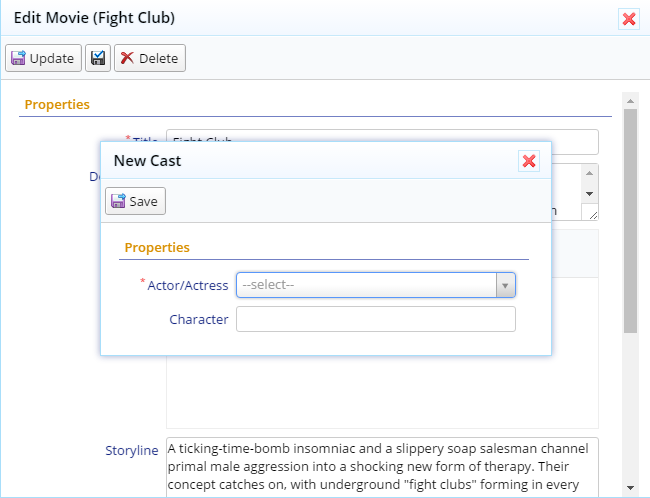 We&apos;ll list the cast for a movie in the Movie dialog and allow them to be edited along with the movie. Also, cast will be saved together with movie entity in one transaction. Thus, cast editing will be in memory, and when user presses save button in Movie dialog, the movie and its cast will be saved to database in one shot (one transaction). It would be possible to edit the cast independently, here we just want to show how it can be done. For some types of master/detail records like order/detail, details shouldn&apos;t be allowed to be edited independently for consistency reasons. Serene already has a sample for this kind of editing in Northwind/Order dialog. This editor derives from Common.GridEditorBase class in Serene, which is a special grid type that is designed for in-memory editing. It is also the base class for Order Details editor used in Order dialog. The <reference /> line at top of the file is important. TypeScript has ordering problems with input files. If we didn&apos;t put it there, TypeScript would sometimes output GridEditorBase after our MovieCastEditor, and we&apos;d get runtime errors. As a rule of thumb, if you are deriving some class from another in your project (not Serenity classes), you should put a reference to file containing that base class. To reference this new editor type from server side, build and transform all templates. This base class might be integrated to Serenity in later versions. In that case, its namespace will become Serenity, instead of Serene or MovieTutorial. By putting [MovieCastEditor] attribute on top of CastList property, we specified that this property will be edited by our new MovieCastEditor type which is defined in TypeScript code. OK, it looked easy, but i&apos;ll be honest, we are not even half the way. Also we&apos;ll have to handle a bit more plumbing like loading and saving cast list on server side (we&apos;ll show the harder - manual way first, then we&apos;ll see how easy it can be using a service behavior). We are using another base class from Serene, Common.GridEditorDialog which is also used by OrderDetailEditDialog. We specified that MovieCastEditor uses a MovieCastEditDialog by default which is also used by Add button. Now, instead of doing nothing, Add button shows a dialog. This dialog needs some CSS formatting. Movie title and person name fields accepts integer inputs (as they are actually MovieId and PersonId fields). getFormKey() method of MovieCastEditDialog returns MovieCastForm.formKey, so it currently uses MovieCastForm.cs generated by Sergen. It is possible to have multiple forms for one entity in Serenity. If i wanted to save MovieCastForm for some other standalone dialog, e.g. MovieCastDialog (which we actually deleted), i would prefer to define a new form like MovieCastEditForm, but this is not the case. 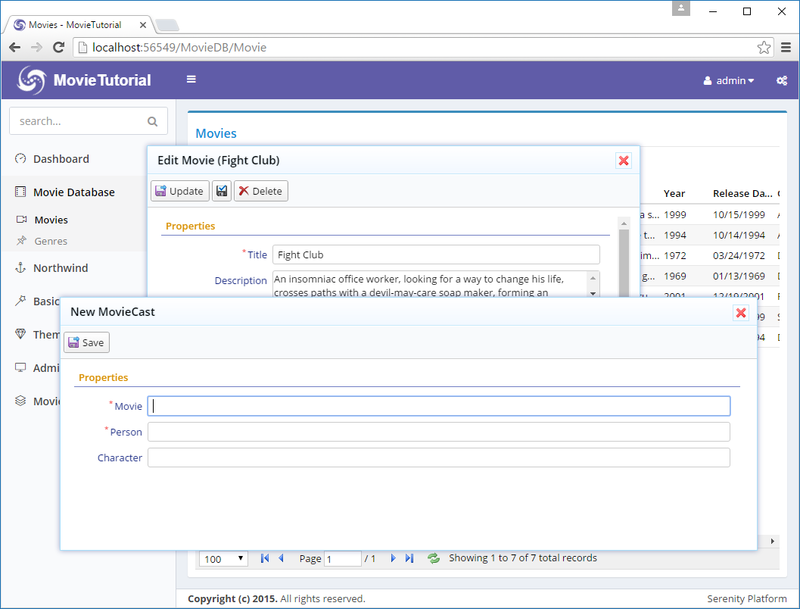 I have removed MovieId as this form is going to be used in MovieCastEditDialog, so MovieCast entities will have the MovieId of the movie currently being edited in the MovieDialog automatically. Opening Lord of the Rings movie and adding a cast entry for the Matrix would be non-sense. I have set editor type for PersonId field to a lookup editor and as i have already added a LookupScript attribute to PersonRow, i can reuse that information for setting the lookup key. Changed PersonId display name to Actor/Actress. Also changed DisplayName and InstanceName attributes for row to set dialog title. 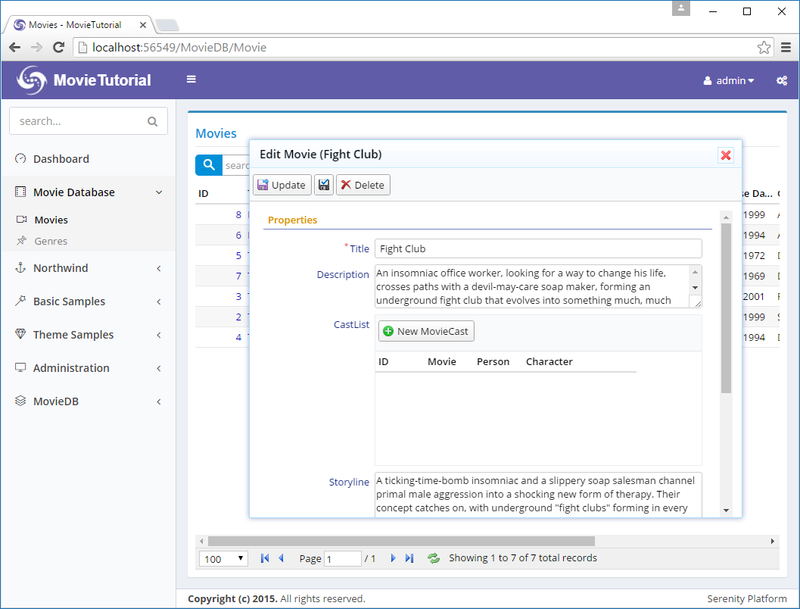 Build solution, launch and now MovieCastEditDialog has a better editing experience. But still too big in width and height. Let&apos;s check site.less to understand why our MovieCastEditDialog is not styled. The CSS at the bottom of site.less is for the MovieCastDialog, not MovieCastEditDialog, because we defined this class ourselves, not with code generator. 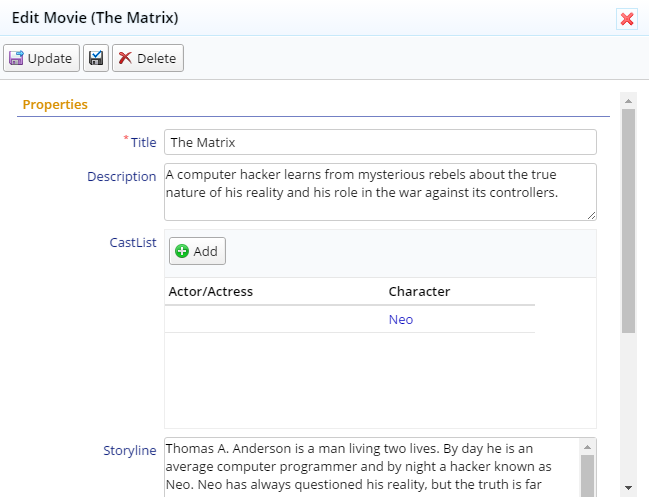 We created a new dialog type MovieCastEditDialog, so now our new dialog has a CSS class of s-MovieDB-MovieCastEditDialog, but code generator only generated CSS rules for s-MovieDB-MovieCastDialog. Serenity dialogs automatically assigns CSS classes to dialog elements, by prefixing type name with "s-". You can see this by inspecting the dialog in developer tools. MovieCastEditDialog has CSS classes of s-MovieCastEditDialog and s-MovieDB-MovieCastEditDialog, along with some other like ui-dialog. s-ModuleName-TypeName CSS class helps with individual styling when two modules has a type with the same name. MovieCastEditor is currently using columns defined in MovieCastColumns.cs (because it returns "MovieDB.MovieCast" in getColumnsKey() method. We have MovieCastId, MovieId, PersonId (shown as Actor/Actress) and Character columns there. It is better to show only Actor/Actress and Character columns. Why Actor/Actress column is empty?? Remember that we are editing in-memory. There is no service call involved here. So, grid is displaying whatever entity is sent back to it from the dialog. There is no PersonFullname field in this entity, so grid can&apos;t display its value. ValidateEntity is a method from our GridEditorBase class in Serene. This method is called when Save button is clicked to validate the entity, just before it is going to be added to the grid. But we are overriding it here for another purpose (to set PersonFullname field value) rather than validation. As we saw before, our entity has PersonId and Character fields filled in. We can use the value of PersonId field to determine the person fullname. For this, we need a dictionary that maps PersonId to their Fullname values. Fortunately, person lookup has such a dictionary. 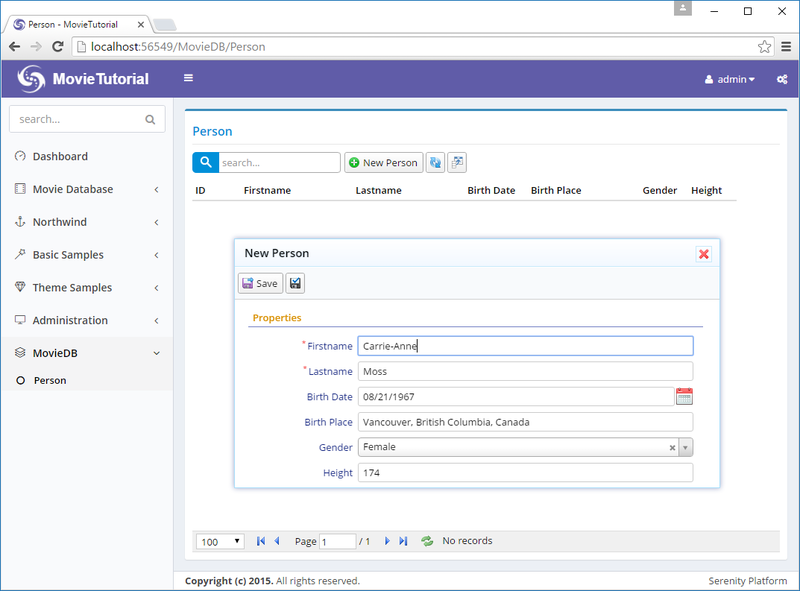 We can access the lookup for PersonRow through its getLookup method. Another way to access person lookup is by Q.getLookup(&apos;MovieDB.Person&apos;). The one in PersonRow is just a shortcut defined by T4 templates. All lookups has a itemById dictionary that allows you to access an entity of that type by its ID. Lookups are a simple way to share server side data with client side. But they are only suitable for small sets of data. If a table has hundreds of thousands of records, it wouldn&apos;t be reasonable to define a lookup for it. In that case, we would use a service request to query a record by its ID. This error is raised from -> Row deserializer (JsonRowConverter for JSON.NET) at server side. We defined CastList property in MovieForm, but have no corresponding field declaration in MovieRow. So deserializer can&apos;t find where to write CastList value that is received from client side. We defined a CastList property that will accept a List of MovieCastRow objects. The type of Field class that is used for such row list properties is RowListField. By adding [NotMapped] attribute, we specified that this field is not available directly in database table, thus can&apos;t be selected through simple SQL queries. It is analogous to an unmapped field in other ORM systems. Now, when you click the Save button, you will not get an error. But reopen the Matrix entity you just saved. There is no cast entry there. What happened to Neo? As this is an unmapped field, so movie Save service just ignored the CastList property. If you remember that in prior section, our GenreList also was an unmapped field, but somehow it worked there. Thats because we made use of a behavior, LinkedSetRelationBehavior with that property. Here we are sampling what would happen if we had no such service behavior. MySaveHandler, processes both CREATE (insert), and UPDATE service requests for Movie rows. As most of its logic is handled by base SaveRequestHandler class, its class definition was empty before. We should first wait for Movie entity to be inserted / updated successfully, before inserting / updating the cast list. Thus, we are including our customized code by overriding the base AfterSave method. If this is CREATE (insert) operation, we need the MovieId field value to reuse in MovieCast records. As MovieId is an IDENTITY field, it is only available after inserting the movie record. As we are editing cast list in memory (client-side), this will be a batch update. We need to compare old list of the cast records for this movie to the new list of cast records, and INSERT/UPDATE/DELETE them. Let&apos;s say we had cast records A, B, C, D in database for movie X. User did some modifications in edit dialogs to cast list, and now we have A, B, D, E, F.
So we need to update A, B, D (in case character / actor changed), delete C, and insert new records E and F.
Fortunately, DetailListSaveHandler class that is defined in Serene, handles all these comparisons and performs insert/update/delete operations automatically (by ID values). Otherwise we would have to write much more code here. To get a list of old records, we need to query database if this is an UPDATE movie operation. If this is a CREATE movie operation there shouldn&apos;t be any old cast record. We are using Connection.List< Entities.MovieCastRow > extension method. Connection here is a property of SaveRequestHandler that returns the current connection used. List selects records that matches the specified criteria (mc.MovieId == this.Row.MovieId.Value). this.Row refers to currently inserted / updated record (movie) with its new field values, so it contains the MovieId value (new or existing). To update cast records, we are creating a DetailListHandler object, with old cast list, new cast list, and a delegate to set the MovieId field value in a cast record. This is to link new cast records with the current movie. Then we call DetailListHandler.Process with current unit of work. UnitOfWork is a special object that wraps the current connection/transaction. All Serenity CREATE/UPDATE/DELETE handlers works with implicit transactions (IUnitOfWork). We are not done yet. When a Movie entity is clicked in movie grid, movie dialog loads the movie record by calling the movie Retrieve service. As CastList is an unmapped field, even if we saved them properly, they won&apos;t be loaded into the dialog. Here, we are overriding OnReturn method, to inject CastList into movie row just before returning the it from retrieve service. I used a different overload of Connection.List extension, which allows me to modify the select query. By default, List selects all table fields (not foreign view fields coming from other tables), but to show actor name, i needed to also select PersonFullName field. Now build the solution, and we can finally list / edit the cast. The way we implemented this master/detail handling is not very intuitive and included several manual steps at repository layer. Keep on reading to see how easily it could be done by using an integrated feature (MasterDetailRelationAttribute). Master/detail relations are an integrated feature (at least on server side), so instead of manually overriding Save / Retrieve and Delete handlers, i&apos;ll use an attribute, MasterDetailRelation. We specified that this field is a detail list of a master/detail relation and master ID field (foreignKey) of the detail table is MovieId. This ensures that PersonFullname field on cast list is selected on retrieve. Otherwise, it wouldn&apos;t be loaded as only table fields are selected by default. When you open a movie dialog with existing cast list, full name would be empty. Make sure you add any view field you use in grid columns to IncludeColumns. Put comma between names of multiple fields, e.g. IncludeColumns = "FieldA, FieldB, FieldC". Now build your project and you&apos;ll see that same functionality works with much less code. MasterDetailRelationAttribute triggers an instrinsic (automatic) behavior, MasterDetailRelationBehavior which intercepts Retrieve/Save/Delete handlers and methods we had overriden before and performs similar operations. We&apos;ll see how to write your own request handler behaviors in following chapters.